Volvo is smart to keep up with the competition. As we reported earlier this week, every new Volvo made from 2019 on will have some form of electrification. Volvo will do this in three ways: with mild hybrids, plug-in hybrids, and all-electric vehicles. While Volvo's decision might seem bold, it's one that could prove necessary for other automakers going forward. Rather than wait until automotive evolution has passed it by, Volvo is choosing to be one of those leading the way. Other companies will follow. The ones that wait will risk falling behind. Volvo says this move is "heralding the end of an era for the pure internal combustion engine." But what does that really mean? The move doesn't seem as bold when you look at what Volvo's competitors are doing. Volkswagen is shifting its focus toward electrification, introducing a number of plug-in vehicles in the coming years. Daimler is building battery factories in a similar effort. Even startups are having an influence on Volvo. "We have to recognize that Tesla has managed to offer such a car for which people are lining up," Volvo CEO Hakan Samuelsson has said. "In this area, there should also be space for us, with high quality and attractive design." Additionally, battery costs are dropping, infrastructure is growing, and more customers are warming up to and even demanding electrification. Still, it remains to be seen how quickly Volvo is actually willing to go down this road. Volvo's plan includes 48-volt mild hybrid systems, plug-in hybrid vehicles, and pure EVs. Volvo Vice President of Vehicle Propulsion Karin Thron Almqvist calls the mild hybrid system, "an accessible steppingstone in the move to full electrification." This starter/motor/generator system helps recover brake energy, which improves economy but doesn't eliminate emissions. Volvo expects this mild hybrid option to make up the bulk of its volume, at least at first, which means its customers will still be consuming a lot of liquid fuel. Almqvist also calls mild hybrid tech "a real alternative to the diesel engine." Volvo, which launched a new generation of engines a few years back, will likely not develop another generation of diesel, according to CEO Hakan Samuelsson. The company still plans to make the most of this generation until about 2023, and says it will use mild hybrid electrification with both gasoline and diesel engines. The company says it still needs to use diesel as part of reaching 2020 C02 emissions requirements, but sees the cost and performance of small gasoline engines improving with mild hybrid tech. So, while they may be more efficient, internal combustion engines aren't going away any time soon. Still, switching Polestar to a performance EV brand, and the promise of a total five all-electric models from Volvo Group (including two from Polestar) by 2021 are encouraging. 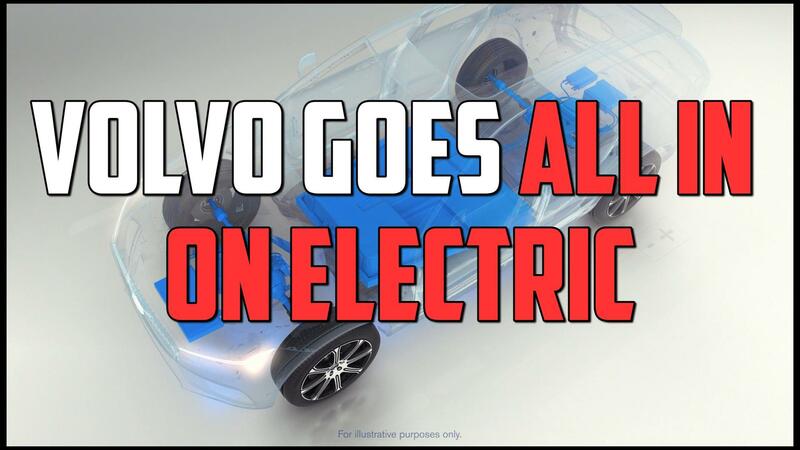 Volvo's goal is to sell a million electrified cars by 2025, at which point Samuelsson says he believes pure electrics will make up a "significant share" of Volvo's sales. Whether the results will be as impressive as the headlines surrounding Volvo's recent announcement, the company is laying the groundwork for an electric future. And as the industry evolution continues to accelerate in that direction, Volvo will be a step ahead. That's more than a lot of other automakers can say.